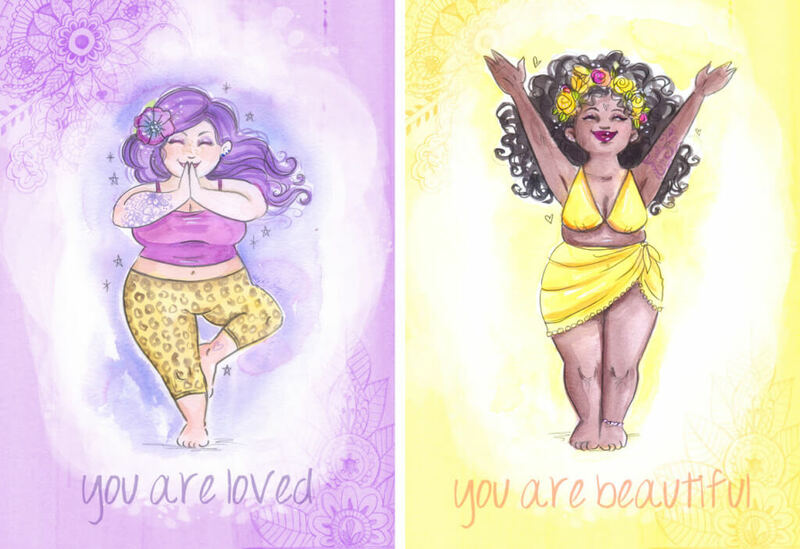 5 Reasons to have more colour in your life! I’ve spent my whole life working with colour without ever truly appreciating it’s power until recently. When circumstances force you to start taking positive steps in your life you learn so much about things you have taken for granted. When times have been hard both emotionally and physically your creativity can take a backseat, or be completely suffocated. Re-discovering your creativity and the fundamental joy you have always found in it can be a revelation! This is why I’ve found colour so important in the last few months. 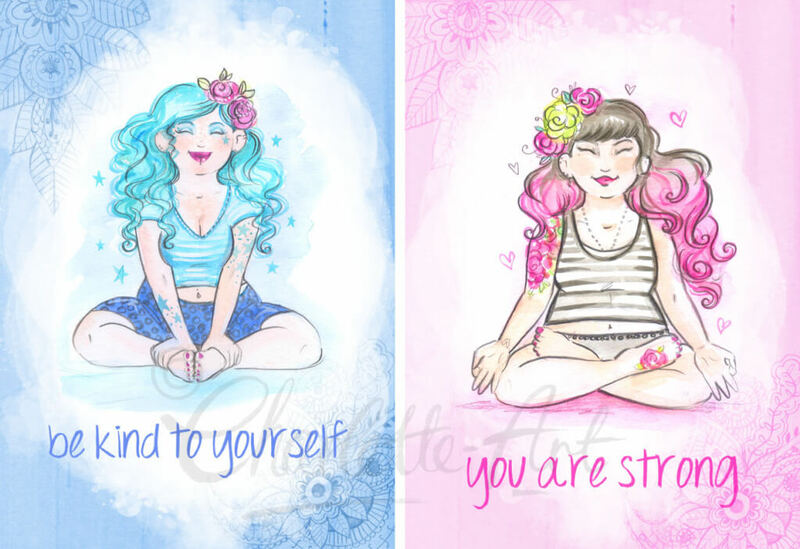 Working with colour through meditation, looking at chakra colours and stepping on my yoga mat again inspired me to get more colour into my life and into my art work, it has helped motivate me and inspire me to enjoy the basic creative process again and create from the heart. 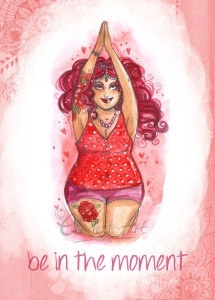 The result is the collection of yoga positive affirmation cards shown in this blog post. I hope they inspire you like they inspired me! 1. Colour triggers memories. A beautiful sunset you once enjoyed? Bright colours of childhood toys? Your favourite flowers? Keep reminding yourself of these positive associations with colour! 2. Colour can lift your mood – vibrant colours are energising, Use oranges, vivid yellows, reds and bright pinks to liven up a dreary day! 3. Colour can ground you and give you strength – a dash of red lippy and I’m ready for anything! 4. Colour can calm you. I find using colour visualisation in meditation helps me focus and create inner space and calm. Visualise the gentler vibrations of lush greens, pale blues, twinkly pale pink and violet to give you some peace. 5. Colour helps your creativity flow. Working with the colours you love, just splashing your paints about and loving the colours that you see is a great exercise for art block. Seeing colours together, how the blend and flow always helps me come up with new ideas. I hope those 5 little things give you a creative boost today! Keep your eyes peeled for more blogs about colour in the coming months, it’s my new favourite subject! 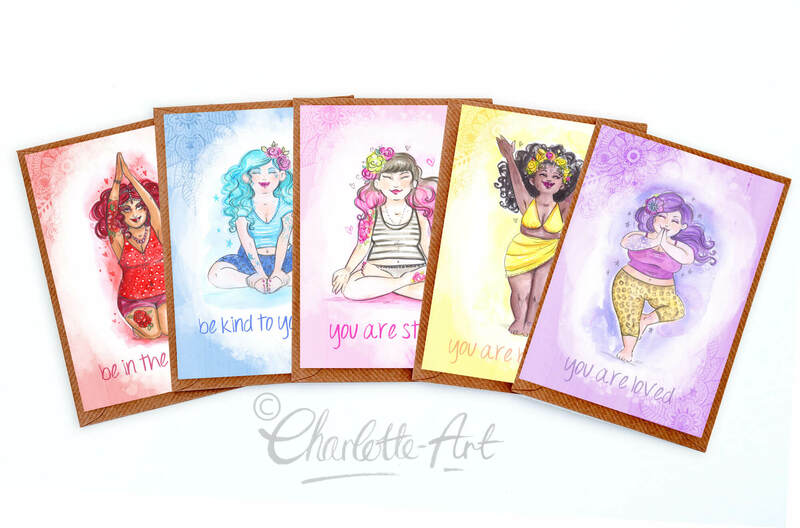 My Yoga Affirmation cards are available to buy on my Etsy Shop!